This body of work by Wellington photographer Ryan McCauley explores a prominent feature of nearly all New Zealanders’ childhood memories… the backyard. A space that overflows with potential through the eyes of a child transforms into neat arrangements of outdoor furniture and pruned hedges or perhaps overgrown and unruly wilderness as childhood imaginations give way to adult indifference. 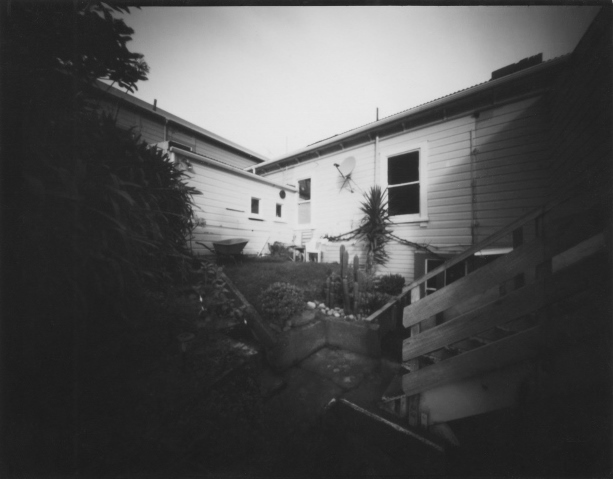 Ryan seeks to explore these spaces through the medium of pinhole photography. The use of the pinhole distorts the view yet the photographic nature of the object having to be present roots the image in a strange and unfamiliar form of reality. The unnaturally wide view creates a distance such as the metaphorical distance and time that separates us from our childhood fantasies. The small size of the works encourages the viewer to engage with the work closely where the ambiguous backyard symbols can trigger a personal mnemonic experience.